I didn’t particularly expect any William Morris-related payoff when I started reading E.M.W. Tillyard’s The Muse Unchained (1958), an insider’s account of the rise of English studies at Cambridge University in the early twentieth century; but there was one, none the less. For a bit-player in that story was the Cambridge Anglo-Saxonist A.J. 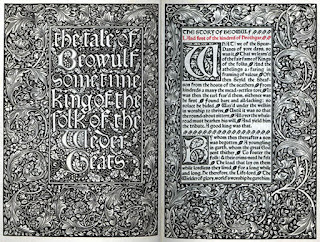 Wyatt, with whom Morris had collaborated on his translation of Beowulf in 1893 – Wyatt providing a prose paraphrase of the original which Morris then ‘rhymed up’ (to use his alarmingly casual phrase). 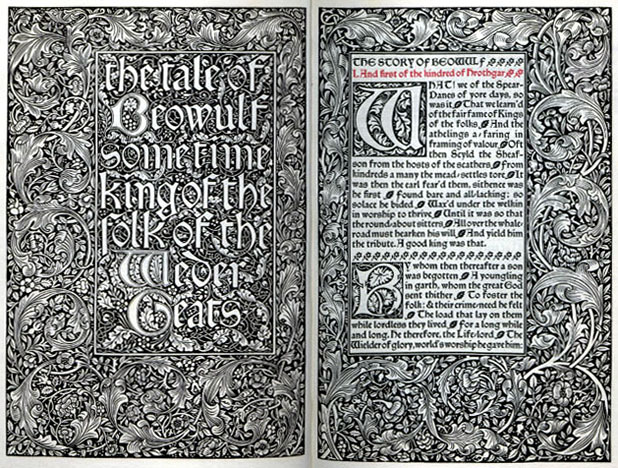 There was also some exchange of views between the two men over the contents of a Kelmscott Press selection of medieval lyric poems just before Morris’s death in 1896. So it is curious, reading Tillyard’s rather personal and gossipy book, to come across other aspects of Wyatt’s Cambridge career. This began admirably enough, with a First in English with distinction in 1891 (p.29). However, disaster struck when the university’s lecturer in English, Israel Gollancz, left Cambridge for London in 1906: ‘The obvious local candidate to succeed him was A.J. Wyatt; but the electors went outside and brought in G.C. Macaulay from Aberystwyth, and Wyatt became a man with a grievance for the rest of his life’ (34). 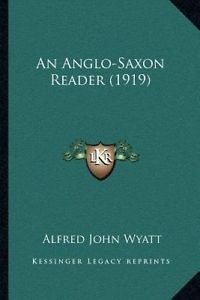 Moreover, he was clearly not thought highly of by the real powerhouse in Cambridge Anglo-Saxon studies, Professor H.M. Chadwick, and as the project for an extraordinarily untraditional, excitingly modern English Tripos emerged at Cambridge in 1916, with Chadwick’s full support, Wyatt set himself implacably against it, becoming something of a ringleader in the process. The three women dons in English ‘all supported Wyatt in his opposition to Chadwick and in his resolution to keep English studies linguistic and philological’ (46). In the run-up to the crucial Special Board meeting on 19 May 1917, ‘there was circulated a short fly-sheet signed by Wyatt alone. It protested against the abolition of compulsory Anglo-Saxon, early medieval literature, and language’ (62). The English studies reforms went through none the less, fortunately, producing within a decade the most dynamic English faculty in the country, with such luminaries as I.A. Richards and F.R. Leavis among its numbers. Chadwick apparently never forgave Wyatt for his resistance to the English proposals, and subsequently ‘bore a huge load of teaching, elementary Anglo-Saxon included, in order that nothing should be left over for Wyatt’ (70). The latter died in 1935, described by Tillyard as to the end an ‘unreconciled survivor of the pre-Chadwickian order’ (132). It all seems a rather sad ending for a man who had once tasted artistic glory in his collaboration with Morris in the 1890s. Tony, I see that J.W. Mackail, in discussing the proposed Kelmscott medieval lyrics volume, says that "Wyatt had sent him [Morris] a list of early English poems for consideration" (vol 2, pp.332-3). Do we know if that list survives, do you think? No, I don't know if Wyatt's list of poems exists, I'm afraid. Wonder if anyone else out there can help us on this? It occurs to me now that perhaps I should have emphasised more in my post that the above rather negative, or even dismal, account of Wyatt's professional life is Tillyard's very personal view of the man. If there are any Wyatt obituaries out there (I haven't yet been able to locate any), they might tell a rather different, perhaps more balanced story.